Pictured: Exclusive Tata Motors Showroom in Learjet Drive, Caboolture. Caboolture based Novacar has been appointed the Tata Motors dealer for Caboolture area and northern Brisbane suburbs with a showroom at 94 Learjet Drive Caboolture. Dealer Principal Michael Bonnici has owned the Novacar business for over three years and has earned a reputation for excellent customer service. All Xenon’s are powered by a fuel efficient, powerful four-cylinder turbo diesel and with a payload of up to 1080kgs and a towing capacity of 2500kgs; the Xenon is proving to be a favourite with tradies, commercial operators and farmers. Michael Bonnici is a generous supporter of the local community, is a Gold sponsor of the building redevelopment at the Caloundra Surf Club, and is a sponsor and Rewards Program partner of the Bribie Island Bowls Club. When asked why he had invested in the Tata Motors franchise, Michael said, “Knowing the people behind the brand at Fusion and Walkinshaw Performance and having past success with them as an HSV Dealer, I knew they were right on track to bring the Tata Xenon to the Australian market. It’s a tough truck with a great deal of value for less than $30,000”. On feedback he has received from his Tata Xenon customers so far Michael added, “Customers are saying things like, It suits our business to a T, it’s so easy to drive and we all love driving it”. Fusion Automotive Managing Director, Mr. Darren Bowler said - “We are delighted to welcome the Novacar to the Tata Motors family. 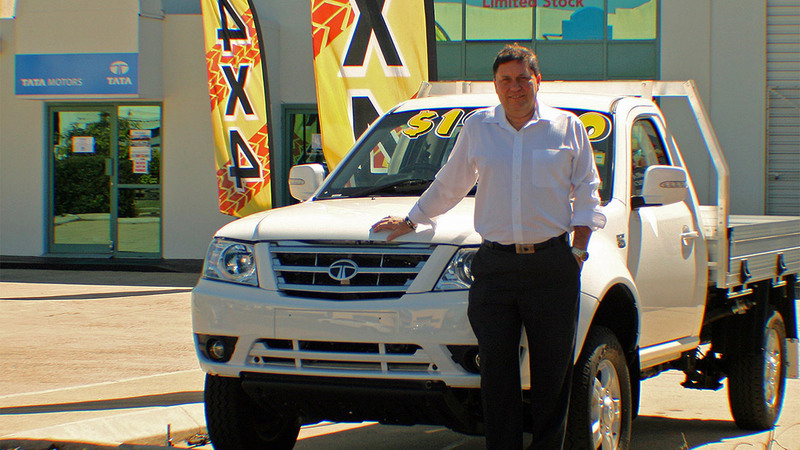 They are a tremendous asset to our expanding dealer network, I know our customers in Caboolture, and the northern Brisbane suburbs will benefit from the highest levels of customer service and satisfaction from Michael, his Sales Manager Darren Smith and all the staff at Tata Motors in Caboolture”. • The Tata Xenon is one of the top ranked diesel light commercial vehicles in the Australian Government Green Vehicle guide. • Tata Motors Limited is India’s largest automobile company, with consolidated revenues of INR 2,32,834 crores (USD 38.9 billion) in 2013-14. • Through subsidiaries and associate companies, Tata Motors has operations in the UK, South Korea, Thailand, South Africa and Indonesia.